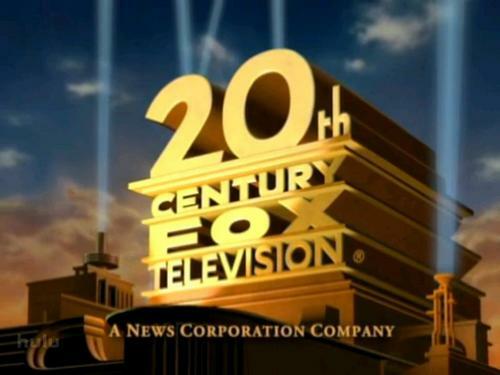 For the second of our hundred television posts celebration that’s…erm…crazy like a fox? 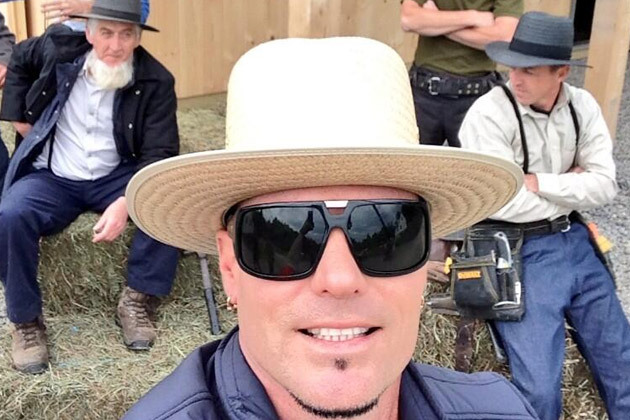 Vanilla Ice takes an Amish selfie…or as they call it a ‘self-portrait’. Last Sunday was the first time I’ve watched the Academy Awards ceremony on TV live and continuously from start to finish. In Britain, the time difference means that if you want to watch the Oscars you have to stay up all night, which sounds fun but in reality resembles an inventive form of torture designed to give the re-opening of Gitmo some Hollywood pizzazz. In recent years, the ceremony hasn’t even been broadcast live on any of the UK’s free-to-air channels but rather on subscription-only cable movie channels as if it were an experimental art film where people open envelopes for five hours. This year’s Oscars were so chocked full of embarrassing gaffes and faux pas that I was able to see the value of watching the ceremony as it went out. Not that the cringing diminishes upon repeat viewing after the fact, far from it in the case of John Travolta, whose creation of an entirely new name for singer Idina Menzel was prefixed with ‘one and only…’. But there’s something uniquely thrilling about seeing these disasters as they unfold in front of the world in the knowledge that they cannot be taken back or censored (even though anything truly provocative would be edited out with delayed transmission). But this year TV wasn’t just the relay of the Oscars, it was part of it. Host Ellen DeGeneres is a creature born of television, with her celebrity coming entirely from talk shows and sitcoms, and Best Actor winner Matthew McConaughey (not a typo, time travellers from the 1990s!) was awarded as much for his part in the celebrated HBO cop series True Detective than his underwhelming (in every sense of the word) performance in The Dallas Buyer’s Club. TV’s assured standing in America both culturally and artistically seems to be getting harder and harder for the Academy of Motion Pictures to ignore each year. 2014 also marked the year that the Oscars took note of the long-standing links between TV and the internet. Of course the web has been reporting news from the Oscars as it happens for decades now, but the Academy’s publicists are finally coming to realise that this is happening in tandem with the live TV coverage and not necessarily in a vacuum from it. This was the first year that Oscars’ coverage was offered as a live internet stream on the ABC website, a long overdue acknowledgement of how TV can be watched without a TV. 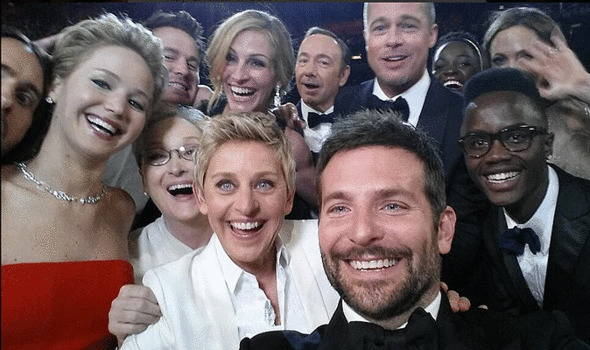 DeGeneres’ Twitter-breaking celebrity selfie perfectly complimented the live-tweeting of the TV broadcast. Even with the slightly more sociable option of live-pausing – for those that have a cable service – the five to six hours of television that the Oscars eats into can still be a slog if you’re going all the way to the Governor’s Ball. Television is medium of repetition to be sure, but even it cannot contain the mechanical monotony of the ceremony and the grinding formula of its acceptance speeches. The land of series marathons and genre channels is still not able to cope with the conformity that the Oscars produce. TV’s unending transmission is about the only way a bloated ceremony like the Oscars could be brought to the world but they’re still pushing at the limits of what even the most entrenched TV viewer can handle. TV gets its money’s worth either side of the ceremony as well. Hours of broadcast prior to the official start time of the Oscars are taken up with reporters transmitting live from the red carpet-lined entrance as stars rotate their bodies more slowly than a Virgin Trains toilet door and answer existential questions like ‘who are you wearing?’. Following the ceremony, various incarnations of Ryan Seacrest try to get the clearly traumatised Oscar guests to talk about what they witnessed before they repress it forever. Then there are the Oscar-themed talk shows and post-show analysis programmes. It’s past midnight before anyone in TV admits there is a world outside the Dolby Theatre. It’s surprising that politicians aren’t block-booking venues for press conferences on embarrassing indiscretions all day on Oscar Sunday. Despite these torments, I’d watch the whole thing through again next year. It certainly beats trying to piece together fragments of information about what happened from rolling news stations the next day, which tends to take the same amount of time as the live coverage anyway. And now that TV is playing a far bigger role in the Oscars than ever before, it’s the obvious place to start.